As D.C. public school students returned to class for the new school year Monday, city leaders pointed to the opening of a brand-new school as an example of how the overall system is improving. WASHINGTON — As D.C. public school students returned to class for the new school year Monday, city leaders pointed to the opening of a brand-new school as an example of how the overall system is improving. 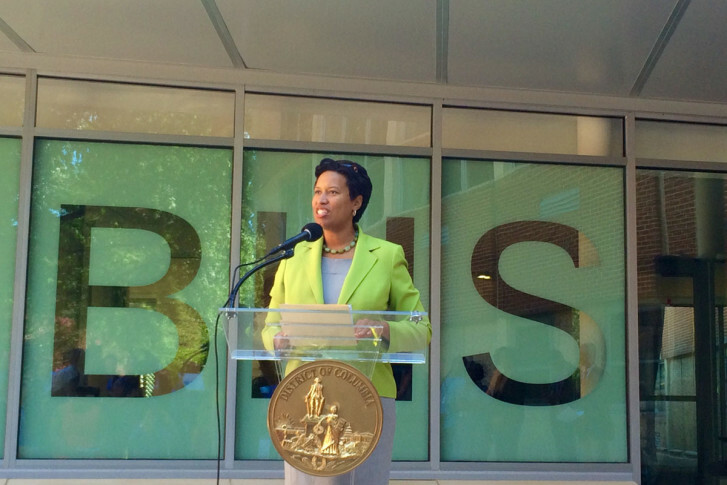 “It gives me great pleasure to welcome all of you to this beautiful school,” Mayor Muriel Bowser announced Monday morning at Ron Brown College Preparatory High School. The all-male school just opened in a renovated building near the Deanwood Metro station in Northeast. The school only offers 9th grade currently, but every year it will expand until it offers 9th-12th grade. “The first day of school is always a very exciting day,” said D.C. Council Chairman Phil Mendelson, who compared it to opening day for baseball fans. As the new school year begins, the public school system in the District is preparing for major changes. Public Schools Chancellor Kaya Henderson will be stepping down at the end of next month. She will be replaced by the Chief of Schools John Davis on an interim basis as a search begins for Henderson’s replacement. Henderson did not mention the change during Monday’s news conference, only saying the school system is “rising” and getting stronger.